Bryan Nesbitt, Cadillac General Manager, introduces the new Cadillac XTS Platinum concept vehicle to the media at the General Motors exhibit at the North American International Auto Show in Detroit, Michigan. Touch navigational screens, Internet, communications systems: Automakers are ramping up an array of connectivity gizmos to lure consumers into buying next-generation vehicles. Some of the whistles and bells on display at the annual North American Internation Auto Show underway in Detroit were purely cosmetic. 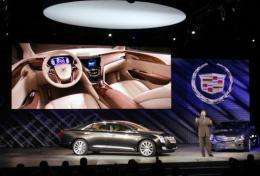 GM's Cadillac presented a prototype of its new XTS sedan that sported a dashboard minus buttons or dials. The black screen illuminates once the engine starts and the door handles light up for a few seconds when the car stops. But most of the innovations put a premium on connectivity. Paul Haelterman, vice president of research firm CSM Worldwide, predicted that five years from now 45 percent of the new vehicles sold in North America would be connected to the Internet, and nearly all of the luxury models. "Having the car connected with the exterior world is a necessity," said Henning Schlieker, a technology marketing executive at BMW North America, told AFP. The German luxury car maker already has begun to equip all its BMW 5 Series, 6 Series and 7 Series cars sold in the United States with BMW Assist, a feature launched a year and a half ago. The BMW Assist allows drivers to locate gasoline stations and their current prices, check weather forecasts and traffic conditions, access navigational tools such as Google Maps and Mapquest, and keep tabs on financial data. The Cadillac XTS offers two separate back-seat screens, each outfitted with its own Internet connection and DVD reader. Ford is launching its MyFord Touch system, which will be introduced first in the upscale Lincoln nameplate under the name "MyLincoln Touch" and then integrated into the Ford Focus in 2012. With the Ford system, drivers will be able to listen to their favorite websites, including an audio version of the fast-streaming Twitter microblogs and music from the Pandora Radio. The screens on next-generation vehicles function with touch commands when the vehicle is stopped, allowing drivers to change their selections without interfering with their driving. Automakers assure that these new functions and Web access in vehicles pose no danger. "We're in the business of safe transportation," Allan Mulally, the chief executive of Ford, said Tuesday at the Detroit show. "You're best driving if you keep your eyes on the road and your hands on the wheel," he added. To avoid distracting the driver, the interactive functions are all operated by voice or by buttons located at the steering wheel. At BMW the screens close to the driver only change when they are changed intentionally and there are no animated graphics or advertising windows that could divert attention, Schlieker said. But in case of an accident, BMW also offers emergency system ACN, or automatic collision notification, which alerts authorities and emergency aid workers, pinpoints the location of the vehicle and provides an assessment of the gravity of the incident. The auto show, which opened Monday in Detroit, the home of the Big Three US automakers General Motors, Ford and Chrysler, is scheduled to close January 24.